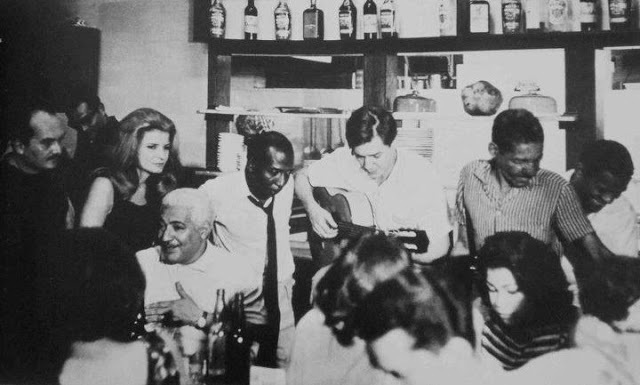 L-R: Billy Blanco, Odete, Dorival Caymmi (seated), Zé Kéti, Tom Jobim, and Cartola at Zicartola. Zé Kéti was largely responsible for bringing together the worlds of bossa nova and samba from the morros of Rio de Janeiro in the early 1960s. Scene in the favela in Rio, 40 Graus. 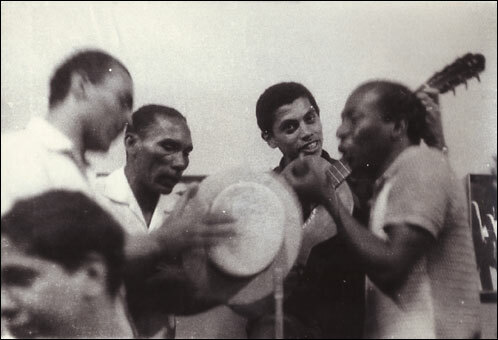 “A voz do morro” was the samba that brought fame to Zé Kéti in 1955, when it rolled as the theme song on Nelson Pereira dos Santos’s film Rio, 40 Graus. (Along with contributing to the soundtrack, Kéti worked as second camera assistant for the film and played a small part as the character Neguinho.) On its own, “A voz do morro” seems like an everyday samba-exaltação, celebrating the nation and the genre; the lyrics alone don’t betray protest or even melancholy. But set against the backdrop of Santos’s film, which follows the lives of five boys from the favela selling peanuts in rich areas of Rio de Janeiro on a scorching summer day, the song is deeply poignant and political. 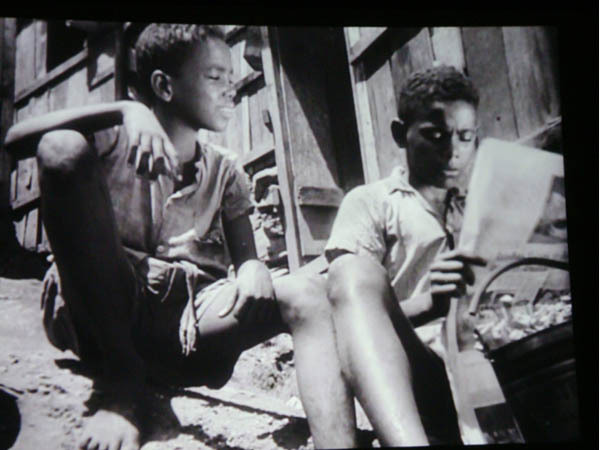 The movie contrasts the lives of these boys with the lives of their rich white neighbors in Copacabana and with the luxuriant natural beauty of the city itself. When it was released, it laid bare in a queasy fashion the class conflict and exploitation of Afro-Brazilian favelados that ran deep in Rio de Janeiro, but that the government, media, and city by and large turned a blind eye to. The movie was styled in the postwar Italian neorealist model of political dramas that mimic documentaries, and marked the start of the Cinema Novo period in Brazil. Ten years later, Kéti’s low-spirited samba “Acender as velas” brought the same themes to light, but this time more acutely. Kéti wrote the song for Ronaldo Bôscoli, who was doing a vignette on his TV show about the hopeless situation of a sick boy in a favela. The samba was released in the wake of the 1964 coup that installed a military dictatorship in Brazil. The military government quickly embarked on a series of harsh and misguided policies for dealing with Rio’s favelas, and Kéti’s sambas responded to this treatment. Kéti spelled his name in a number of different ways; this ID shows one of them. Kéti grew up at his grandfather’s house in Bangu until 1928, when he and his mother moved to Dona Clara, a section of the north-zone neighborhood Madureira, the samba bastion that’s home to the samba schools Portela and Império Serrano. In this 1973 documentary, Kéti recounts that his grandfather was a piano and flute player who was friends with Pixinguinha and Cândido das Neves. Kéti’s father was also a composer, guitar and cavaquinho player, and Kéti attributes his fascination with music from a young age to their influence. Kéti’s father died when Kéti was still a young boy, apparently poisoned by an ex-lover. (The samba “Meu pai morreu” is about this story; Keti said his father went crazy and died on Rio’s Praia Vermelha.) Kéti’s mother, a fabric factory worker and domestic servant, brought him along on her nights out at samba bars, and Kéti said he would always sit near the music – entranced – rather than playing with the other kids. Eventually his mother granted his pleas for a flute, and he started making music. Zé Kéti followed in Ciro Monteiro’s footsteps playing percussion on a matchbox. He said to play, the matchbox couldn’t be too full nor too empty. As a young man Kéti began frequenting the Portela samba school and composing. When he was 24, the group Vocalistas Tropicais released his composition “Tio Sam no samba,” marking his first samba to be recorded. Shortly after, Ciro Monteiro – Kéti’s inspiration in the art of playing percussion on a matchbox – recorded Kéti’s samba “Vivo bem.” But again, fame only came years later, in the mid-1950s: Nelson Pereira dos Santos was looking for a sambista for the soundtrack for Rio, 40 Graus, and actor Artur Vargas Junior brought Zé Kéti in to sing for him. Santos was enchanted – so much so that, as relates in this program, his next film with a similar theme, Rio, Zona Norte, was a tribute to Zé Kéti, who was represented by Grande Otelo‘s character. 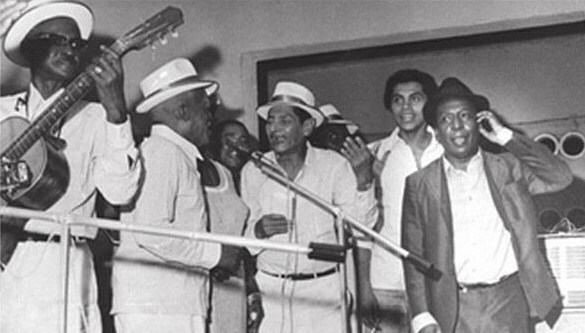 Standing, L-R: Anescarzinho do Salgueiro, Jair do Cavaquinho, Paulinho da Viola and Zé Kéti at Zicartola. In 1963, Cartola and his wife Zica opened their legendary restaurant Zicartola and appointed Zé Kéti as artistic director of the house. Kéti was largely responsible for launching the careers of samba greats including Paulinho da Viola, who went into Zicartola in 1964 as the unknown Paulo Cesar and quickly rose to fame under his new artistic name. 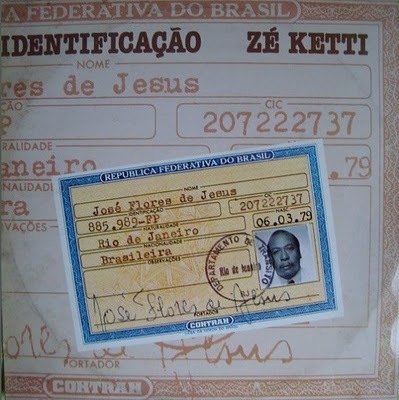 In the same 1973 documentary, Kéti says Paulinho’s nickname was, “modesty aside, given by his friend Zé Kéti,” inspired by Império Serrano’s Mano Décio da Viola. Kéti’s friend, journalist Sérgio Cabral, hastily used the nickname in his newspaper column and it thus became official. During his time at Zicartola, Zé Kéti became friends with Carlos Lyra, and the two made a deal: Kéti would take Lyra to samba schools in the outskirts of Rio de Janeiro if Lyra introduced Kéti in the bossa-nova-dominated Zona Sul. That’s how Zé Kéti ended up playing a pivotal role in popularizing samba from Rio’s morros among the city’s elite, and throughout the country and the world. João do Vale, Zé Kéti, and Nara Leão on stage with the show Opinião. 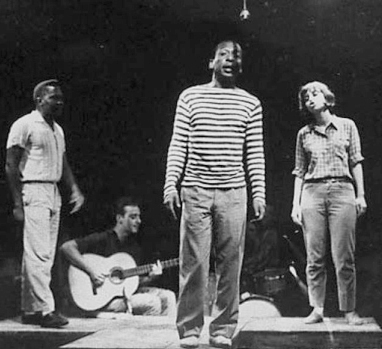 Also in late 1964, the Teatro Arena opened up in Copacabana and Zé Kéti was invited to act alongside Nara Leão and João do Vale in a musical play named after his samba “Opinião.” The show addressed social strife in Rio through the three characters: João do Vale played a northeastern migrant, Kéti played the part of the malandro carioca, and Nara played the rich student from the Zona Sul. They toured the country with the tremendously popular play; the theater ended up taking on the name Opinião, and when Nara Leão took time off to rest her voice, she recommended Maria Bethânia as her replacement, and another star was revealed. R-L: Zé Kéti, Paulinho da Viola, and the Velha Guarda da Portela. 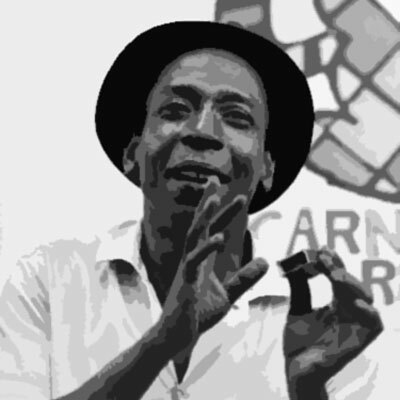 Among Kéti’s other major hits is the Carnival march “Mascara Negra” (1967, with Hildebrando Pereira Matos), which won first place in the 1967 Carnival contest and remains one of Brazil’s most beloved Carnival themes. Kéti was soft spoken, humble, and good humored, a devoted member of the Portela samba school and fan of the Vasco da Gama football club. He died on November 14, 1999, a year after receiving the prestigious Shell Prize for MPB, and a few months after the death of his close friend Carlos Cachaça, which had left him deeply distraught. He was buried in Inhaúma, with the blue-and-white Portela flag, as “Voz do morro” played in the background. A few notes on the translations: morro means hill or hillside, but here and in general refers to the community on the hillside – the favela; terreiro was the space where Afro-Brazilian religions were practiced and where samba was created and performed; and the line “we die without wanting to die” could also be translated as “the people die without wanting to die,” since the Portuguese line says a gente, which can mean both “we” or “the people.” Since a gente is almost exclusively used in Rio to mean “we,” that’s how I translated it in the song. Main sources for this post: Hello, Hello Brazil: Popular Music in the Making of Modern Brazil by Bryan McCann; Bossa Nova: The Story of the Brazilian Music that Seduced the World by Ruy Castro; and A Canção no Tempo: 85 Anos de Músicas Brasileiras, vol. 1 &2, by Jairo Severiano and Zuza Homem de Mello. 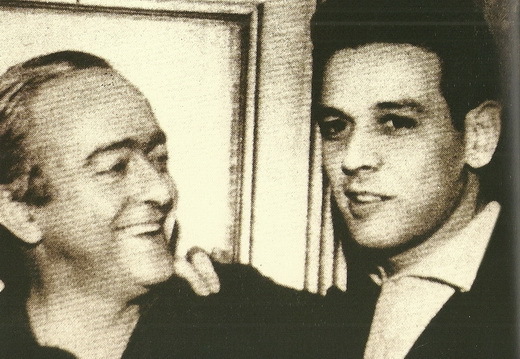 Vinicius de Moraes and Carlos Lyra in the early 1960s. “Marcha da Quarta-Feira de Cinzas” (March of Ash Wednesday) is a seemingly prescient protest song: Vinicius de Moraes and Carlos Lyra wrote the song in 1963, on the cusp of the coup that installed a military dictatorship in Brazil until 1985. The lilting lyrics that lament the end of Carnival can be interpreted as mourning the end of a brighter, more carefree period in Brazil. Jorge Goulart was the first singer to release “Marcha da Quarta-Feira de Cinzas” in 1963, but Nara Leão’s 1964 recording made the song a hit. In the documentary Mosaícos – A Arte de Vinicius de Moraes, Vinicius and Carlos remember the beginning of their partnership, which Vinicius says began in 1962. Carlos Lyra recalls, “When he made Orfeu with Tom [Jobim], I practically fell in love with Vinicius.” (Orfeu marked the start of Vinicius’s musical partnership with Tom Jobim, in 1956. ) Lyra continues, “I called his house and said, ‘Hi, this is Carlos Lyra’ and he said ‘Oh – little Carlos!’ — going ahead and belittling me (laughing) — I’ve heard a lot about you, what can I do for you?’ So I decided to get diminutive too, and said, ‘Oh, I’d just like some little lyrics!’ And he said to come on over!” Before long, Carlos Lyra, like Tom before him, found himself working with Vinicius on lyrics for a musical, Pobre Menina Rica (1964). Sometimes the hunger was such that a lotta times we stirred up a little fight to go eat some grub in the slammer. Ah, good meal in the stomach… But, forgive my language, we gave it all back afterwards, cause the grub was already spoilt. But, while it was still in our stomachs… calm… what joy! Nah, but now things is gettin’ better, ya know? There’s a really nice lady, over there in Leblon, who really likes to see me swaller shards of glass. That’s some real kindness! With that, I already saved some five hundred thousand réis. When I get a little more, I’m getting gone. I’m going back to my Ceará. 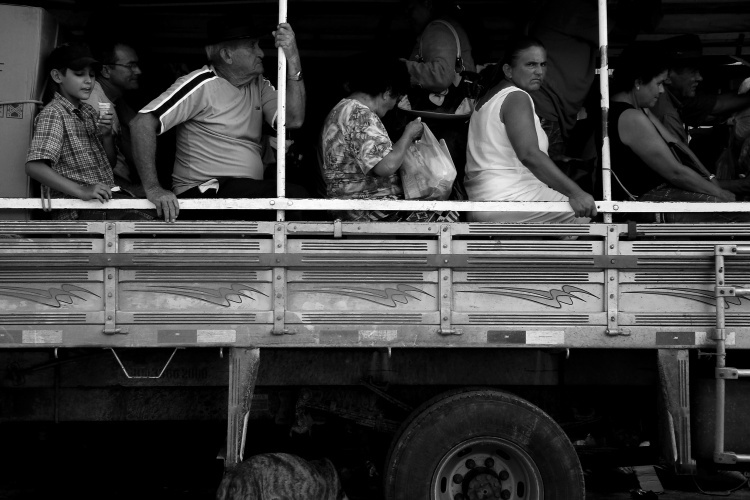 The pau de arara truck, which migrants traveled on for days to reach cities like Rio de Janeiro, São Paulo and Belo Horizonte. The Xaxado is a traditional northeastern dance in which dancers shuffle, or “drag,” their feet to the rhythm (see this YouTube video). The name Xaxado – pronounced “sha-shado” – is an onomatopoeia for the sound the dancers’ feet make dragging on the ground. I translated literally, “…What hunger I had” – even though it’s not something we would say in English – mostly to keep the first line as true to the original Portuguese as possible: “…I had nothing, what hunger I had.” Some of the northeastern accent/dialect in the song — “para as moças oiá,” “não pode ficá” — is lost in the English translation, though I’ve tried to keep it where I could. This song was written during the years of closest collaboration between Carlos Lyra and Vinicius de Moraes. In 1962, Carlos presented Vinicius with a set of melodies in need of lyrics. To Carlos’s surprise, Vinicius declared that the songs went perfectly together, and should be turned into a musical. During a summer stay in Vinicius’s home in Petrópolis, a mountain resort town in Rio de Janeiro where Vinicius had also written the lyrics for “Garota de Ipanema,” the two worked on the songs together. Vinicius wrote lyrics for Lyra’s melodies and wove them into a story called Pobre Menina Rica, Poor Rich Girl. The musical play was written with Nara Leão in mind as the protagonist, a lonely rich girl who falls in love with a disabled beggar living outside of her home. The play was put on first at Teatro Maison de France, then moved to Teatro de Bolsa, at which point some of the actors were replaced. That’s when the comedian Ary Toledo (singing in the video above) began playing the role of the migrant from Ceará, who was based on a poor northeasterner, familiar to Vinicius, who lived on Copacabana and got by dancing Xaxado and swallowing razors. Toledo asked Carlos Lyra for permission to record the song for the soundtrack, in 1964, and went on to record a live version at Teatro Record during the program O Fino da Bossa, hosted by Elis Regina and Jair Rodrigues. The audience laughed heartily at Toledo’s comic performance, as you can hear in the recording. Tom Jobim was meant to provide musical arrangement for the album Pobre Menina Rica, and Elis Regina, just 19 years old at the time, was considered to sing the rich girl’s songs on the soundtrack. Tom nixed Elis for the role, though, saying her disheveled appearance made her look more like a country bumpkin than a patrician (even though no one would actually have seen her). Ultimately, Tom didn’t end up handing in musical arrangements, either. Carlos Lyra said this was because the 1964 military coup left Tom worried about dictatorship’s reaction to the musical’s “social theme”; Tom said he just didn’t have time. Thus, for the soundtrack, the part of the rich girl ended up going to Dulce Nunes, and Radamés Gnatalli took over the musical arrangement. And so, as Ruy Castro mentions in Chega de Saudade: A História e as Histórias da Bossa Nova, Pobre Menina Rica “missed the chance to bring together Tom Jobim and Elis Regina ten years earlier than they finally ended up working together,” on the legendary 1974 album Elis & Tom. Foi aí que eu resolvi comê gilete. Tinha um compadre meu lá de Quixeramubim que ganhou um dinheirão comendo gilete na praia de Copacabana. De dia ele ia de casa em casa pedindo gilete véia, e de noite ele comia aquilo tudinho pro pessoal vê. Eu não sei não, mas acho que ele comeu tanto, que quando eu cheguei lá na praia aquele pessoá já tava até com indigestão de tanto vê o camarada comê gilete. Uma vez, eu tava com tanta fome que falei assim prum moço que ia passando: “Decente! Voismecê deixa eu comê uma giletezinha pra voismecê vê?” “Sai pra lá, pau-de-arara. Tu não te manca, não?” “Oh, distinto! Só uma, que eu não comi nadinha ainda hoje.” “Tu enche, hein, pau-de-arara!” Aquilo me deixou tão aperriado, que se não fosse o amor que eu tinha na minha violinha, eu tinha arrebentado ela na cabeça daquele pai-d’égua. Às vezes a fome era tanta que volta e meia a gente arrumava uma briguinha pra ir comê uma bóia no xadrez. Eta quentinho bom na barriga… Mas, com perdão da palavra, a gente devolvia tudo depois, que a bóia já vinha estragada. Mas, enquanto ela tava ali dentro da barriga… Quietinha… Que felicidade! Não… Mas agora as coisas tão meiorando, sabe? Tem uma senhora muito bondosa, lá no Leblon, que gosta muito de vê eu comê caco de vrido. Isso é que é bondade da boa. Com isso, já juntei assim uns quinhento mil réis. Quando tivé mais um pouquinho, eu vou-se embora. Volto pro meu Ceará. Main sources for this post: A Canção no Tempo: 85 Anos de Músicas Brasileiras, vol 2: 1958-1985, by Jairo Severiano and Zuza Homem de Mello; Chega de Saudade: A História e as Histórias da Bossa Nova by Ruy Castro; and the documentary Vinícius (2005).